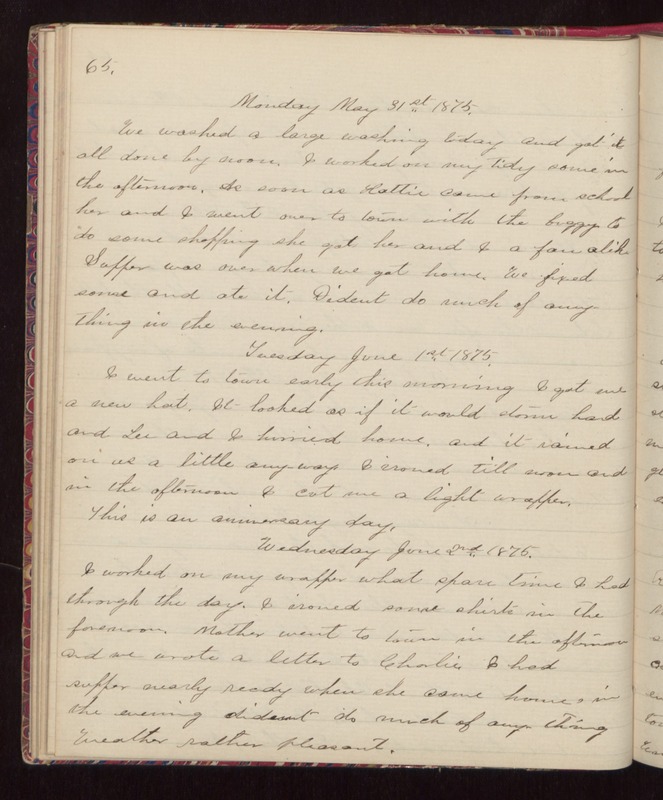 65 Monday May 31st 1875. We washed a large washing today and got it all done by noon. I worked on my tidy some in the afternoon. As soon as Hattie came from school her and I went over to town with the buggy to do some shopping she got her and I a fan alike Supper was over when we got home. We fixed some and ate it. Dident do much of any thing in the evening. Tuesday June 1st 1875. I went to town early this morning I got me a new hat. It looked as if it would storm hard and Lee and I hurried home, and it rained on us a little anyway. I ironed till noon and in the afternoon I cut me a light wrapper. This is an anniversary day. Wednesday June 2nd 1875. I worked on my wrapper what spare time I had through the day. I ironed some shirts in the forenoon. Mother went to town in the afternoon and we wrote a letter to Charlie. I had supper nearly read when she came home, in the evening dident do much of any-thing Weather rather pleasant.